I know I am a current member, but I have not received any emails from the WBAI since joining/renewing? First, check your spam folder. If you see that the WBAI emails are going to the spam folder, make sure to change the appropriate settings in your email program to ensure that wbai@wbaillinois.org is approved. Second, check with your IT administrator to ensure that WBAI emails are not getting blocked by your employer before going to your spam folder. Can I attend WBAI events if I am not a member? Yes, non-members can attend those events not exclusive to our members, including our Annual Installation Dinner, Judicial Reception, Top Women Lawyers in Leadership Award Reception and Golf Outing, to name a few. However, members often enjoy discounted tickets, and can attend those events accessible only to members, including CLE. To learn more about all of our upcoming events, check out our Events Calendar. If you want to check if your membership is current, meaning that your dues are paid and we have the correct contact information, practice area(s), employer information and other affiliations listed in our database, please login to the website and review your membership profile. You can also contact Monique Austin, WBAI Executive Director, at wbai@wbaillinois.org, or at (312)341-8530. I am a law student or a recent graduate that is not licensed yet, can I join? Yes, we offer free law student memberships and memberships for attorneys with less than one year of practice. More information here. Membership dues are paid annually. Payment of dues during a given bar year provide membership through June 30 of the bar year. New Bar Admittee (first year admitted to the Illinois bar): Free! Click here for more information on the types of membership we offer. For more information about joining the WBAI’s event, civic and other committees, check out our Committees Page. Email the co-chair of the committee you would like to join. Please make sure you have joined or renewed for the current bar year (July 1 – June 30). Interested in joining or starting a committee or group that we don’t currently have? We would love to hear from you! Please contact Monique Austin, Executive Director using our contact form, at wbai@wbaillinois.org or (312)341-8530, and she will get you in touch with the right people to make it happen. What if I don’t live or practice in Chicago? Our members come from all over the state of Illinois. One way to get involved is to join the House of Delegates! Exclusively for our members who live or work outside of Cook County, the WBAI is currently looking for Delegates from all districts to serve for two year terms. For more information, including requirements, check out our House of Delegates Page. How can I become involved in the WBAI? Join a Committee! For more information about the WBAI’s event, civic and other committees, check out our Committees Page. Sponsor or attend an Event! The WBAI hosts a wide variety of events for professionals in the legal community, including our Annual Installation Dinner, Judicial Reception, Top Women Lawyers in Leadership Award Reception and Golf Outing, to name a few. To learn more about our upcoming events and to learn about sponsorship opportunities or to purchase individual tickets, check out our Events Page and Calendar. Chair or Host an Event! Do you have a great idea for a new event, or improving upon an existing event? Do you have the perfect space or a great connection that would help with a WBAI event already in the works? Do you have a great idea for a program, conference, or CLE? We would love to hear it! Please contact Monique Austin, Executive Director, using our contact form, at wbai@wbaillinois.org or (312)341-8530, and she will get you in touch with the right people to make it happen. How can I join the WBAI? Joining is easy. To join now, visit our Membership page and sign up, or contact Monique Austin, Executive Director, using our contact form, at wbai@wbaillinois.org or (312)341-8530. Am I eligible to join the WBAI? Anyone can join—lawyers, law students, judges, professors, men and women, to name a few—and you don’t have to live or practice law in Chicago. Our members are located all over the state of Illinois. For most memberships, you just have to be an Illinois licensed attorney. However, law students and recent graduates can also join. To join now, visit our Membership page to sign up online, or contact Monique Austin, WBAI Executive Director using our contact form, at wbai@wbaillinois.org or (312)341-8530. Why should I join the WBAI? Membership Directory: Looking for a mentor, a colleague, a law school classmate, a referral, or an answer to a question? Look no further than our comprehensive Membership Directory for the names, contact information, practice areas, employers and other affiliations of our active members. Website Access: Access to secured portions of the WBAI website, including job postings, the membership directory, newsletters, message boards, and more! Events: The WBAI hosts a wide variety of key events for professionals in the legal community, including our Annual Installation Dinner, Judicial Reception, Top Women Lawyers in Leadership Award Reception and Golf Outing, to name a few. To learn more about our upcoming events, check out our Events Page and Calendar. 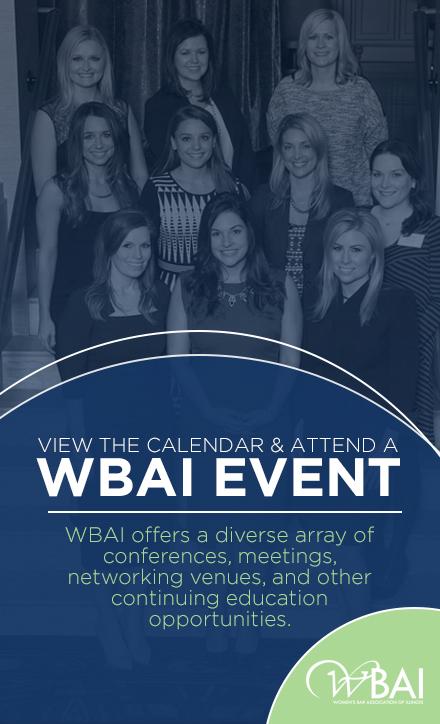 CLE: The WBAI offers free CLE to members through attendance at a multitude of programs throughout the year, including its Women in Law Symposium. For more information, check out our CLE offerings. Giving Back: Through partnerships with local charities and non-profits, the WBAI gives back to those in need in many ways. For more information about giving back, as well as such initiatives as Dress For Success check out our Community Outreach committee and learn what they’re up to and how you can get involved. Newsletter: The WBAI publishes a quarterly newsletter which not only covers recent events and noteworthy happenings involving our members, but also offers members an opportunity to publish their written work. For more information about our newsletter, publishing your piece, and for archives of past issues, check out our Newsletter page. Mentoring: The WBAI facilitates both formal and informal mentoring. For more information about our formal mentoring program and CLE available for participation, check out our Mentoring Program. Make friends and have fun: We are proud to say that we consistently receive feedback from our members and event attendees about how great it was attend an event and catch up with old friends. Check out our Photo Gallery—just look at those smiles! You can’t deny everyone had a good time. …and many, many more benefits. Don’t believe us? See what our members themselves are saying by checking out Member Testimonials. Sustaining Members provide unique support to the WBAI’s programs and services and are recognized on the WBAI website and major event program books for their added commitment. Dues for Sustaining Members are $250.00.